The Town contracts with Advance Disposal for rubbish and recycling collection services. They would like to remind customers of current policies. ~ Garbage and recycling carts should have at least 5 feet of separation between containers, allowing easier pick up of garbage carts. ~ Carts should be set out early morning of the assigned pick up date. ~ Carts must be removed from Town ROW within 24 hours of garbage or recycling pickup. ~ All garbage should be properly bagged. ~ Advance Disposal collects with two separate trucks, one for garbage and another for recyclables. ~ Recyclables: please use the blue-lidded recycling cart to its fullest potential. ~ Do not recycle plastic grocery bags or place recyclables in plastic bags. Doing so jambs the recycling machines and greatly reduces the efficiency of the recycling process. When a holiday occurs, all curbside pickup is delayed one day; New Year’s Day, Memorial Day, July 4, Labor Day, Thanksgiving, and Christmas Day. 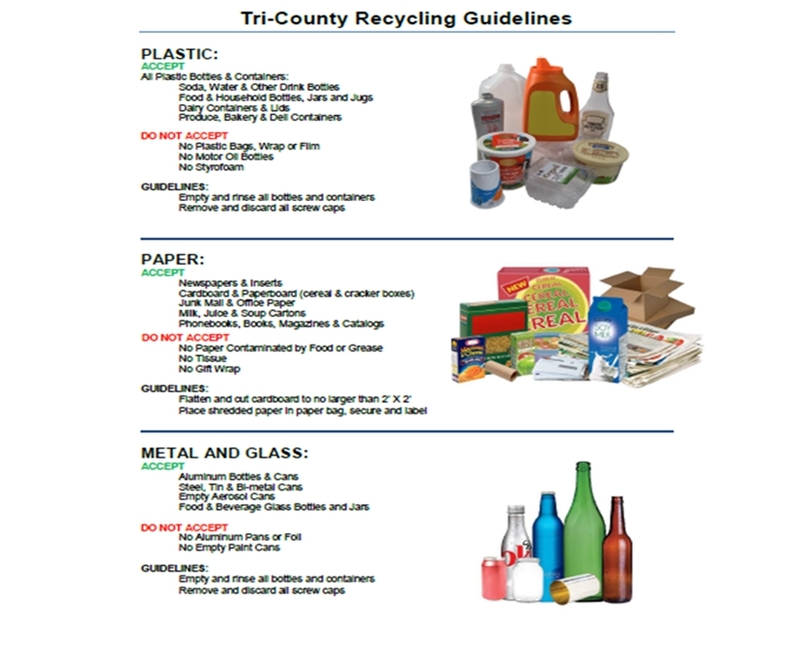 As part of the Tri-County Recycling program all residents of Brown County can recycle more materials than ever before. The following guideline provides a concise summary of what everyone should be recycling. To find other recycling options in your community, see the Wisconsin Recycling Markets Directoryhttp://www4.uwm.edu/shwec/wrmd/search.cfm on the U.W. Cooperative Extension Solid and Hazardous Waste Education website. Two options for removal of appliances and other items: Call the Town’s garbage / recycling hauler Advance Disposal at (920) 983-3341 or J & S Services (920) 883-0140.